I'm real excited to share this tutorial with you! Altered Art is something that I've been in awe of for a few years. I admire the abandon at which the artists mix all sorts of elements to create unique items. I'm happy with the results of this endeavor and hope to gain more confidence as I explore this venue. You just need to rough it up a bit so the Mod Podge has something to stick to. With your paint brush, paint just one even layer on the top. 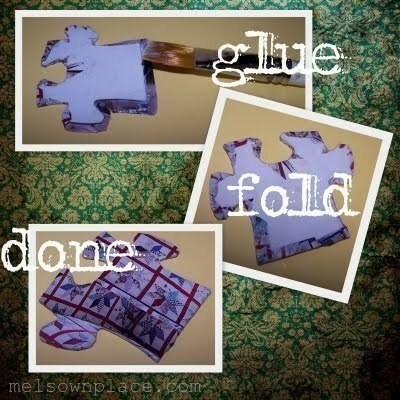 Cover top of puzzle piece with your chosen magazine image. 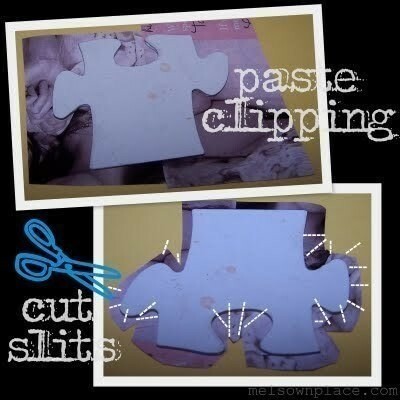 Arrange your magazine clippings so that the entire puzzle piece has been covered and that there is enough to wrap around to the back. Cut slits to aid in wrapping the magazine clipping around to the back. From the back, apply Mod Podge to the excess area. Fold excess to back of puzzle piece making sure that it lays smoothly. Perhaps you have more magazine clippings you'd like to add. 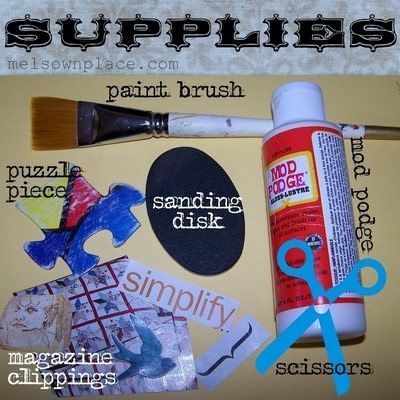 Simply apply another even application of Mod Podge for each new layer you add. Allow the adhesive to dry before adding more layers. TIP: Layout your desired arrangement before gluing into place to make sure you have room for everything. Finish with a top coat of Mod Podge. 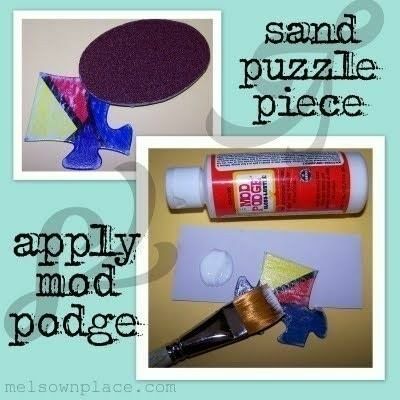 Add 3 dimensional elements if desired when you are finished using the Mod Podge and your piece is dry. 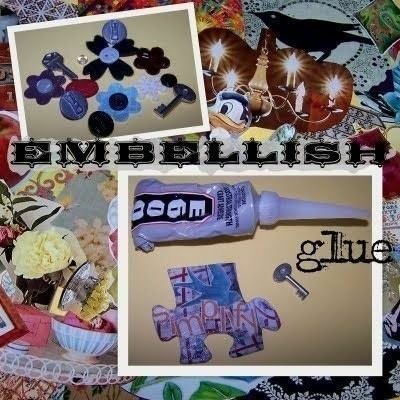 Use a strong industrial strength glue to secure your object. Let's tidy up the look of the back of the piece before we add the magnet. 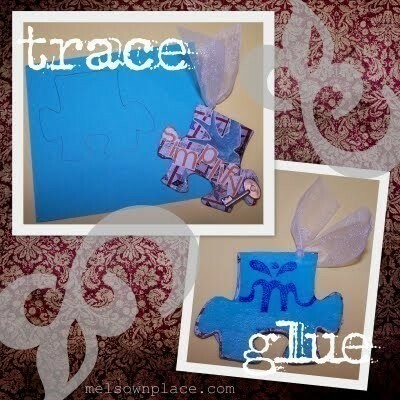 Using your puzzle piece as a template, trace shape on a piece of cardstock paper. You don't want any excess showing from the front view, so trim as needed. 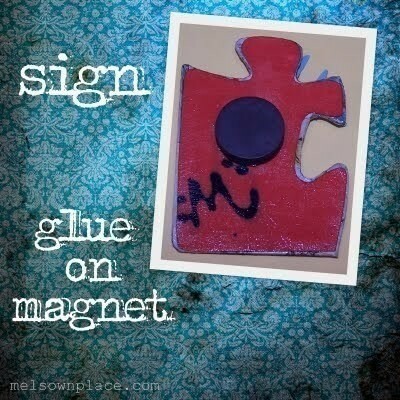 Paint a layer of Mod Podge on the back then apply the paper. Apply another application of Mod Podge on top of the paper you've just added. This will 'seal' the paper. When the back is dry, sign your art piece with a stamp or your unique signature. NOTE: I drilled a small hole, threaded the ribbon and tied it in a knot. I use industrial strength glue such as E600. A little dab will do ya! Allow adhesive to dry completely. Spray a clear coat finish on entire piece, front and back. 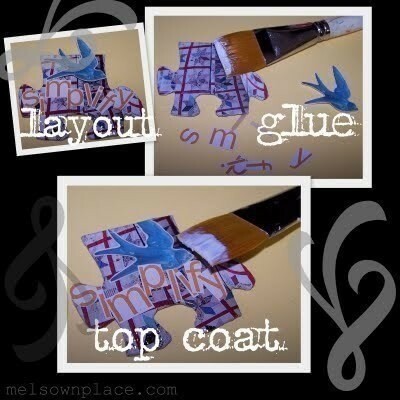 NOTE: If you are adding ribbon, wait until your clear coat is completely dry before tying to puzzle piece.